The Avalon Peninsula has a long history of mining activity. Most people are familiar with the Bell Island iron mines, but few are aware that a small mine near Manuels, Conception Bay, has been around for about the same length of time. It is locally known as the Talc Mine, although the mineral of interest is actually pyrophyllite. 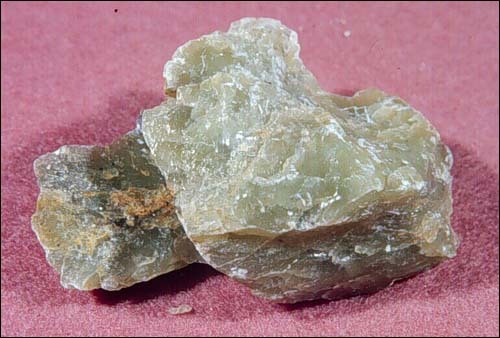 Pyrophyllite has a different chemical composition from talc, but the two minerals have some properties in common, such as softness and a light colour. This is probably why Frederick Andrews, the original developer, called it the Talc Mine. The physical properties of pyrophyllite and talc are practically identical. The main difference is that pyrophyllite has an abundance of aluminum in its chemical make-up and talc has an abundance of magnesium. Reproduced by permission of David Liverman, Government of Newfoundland and Labrador. From Geological Survey of Newfoundland and Labrador - "Minerals of Newfoundland and Labrador: Industrial Minerals." https://www.gov.nl.ca/mines&en/geosurvey/. Talc is a mineral of low to medium grade metamorphic rocks rich in magnesium. It is often derived from ultrabasic igneous rocks made up of enstatite and olivine. Mr. Andrews acquired the property in 1902 and put it into production in 1904, and an aerial tramway to the nearby railway and dock facilities at Seal Cove was constructed. The company went bankrupt in 1906. Mr. R. K. Bishop of St. John's reopened the mine in 1909, but it closed again in 1910. 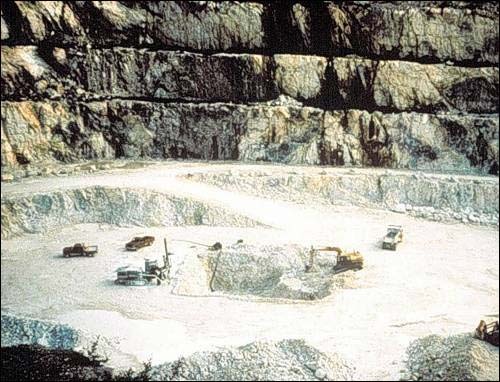 The earliest production came from small quarries on the sides of Mine Hill, a prominent ridge near the present-day operations. The early workings can still be seen, and some pods of pyrophyllite are visible near the workings. The deposits on Mine Hill were probably mined first because they were the easiest to quarry. The best-quality deposits were not developed until 1938, when the Industrial Minerals Company of Newfoundland Limited started mining at the present site. They shipped to the United Kingdom, the United States and Canada until the mine closed in 1947. The Newfoundland government assumed control of the property under the Undeveloped Mineral Area Act of 1952. It was reopened in 1956 by Newfoundland Minerals Limited, a subsidiary of a company that later became the American Olean Tile Company. A geological report written at that time concluded that there was a deposit of 1.5 million tons of ore to a depth of 300 feet. At the rate of 10,000 tons a year, it would be operating for 150 years! Historically, the mining rate has actually been about 40,000 tons per year. Subsequent exploration drilling, however, has added to the reserve estimates, projecting its operation well into the 21st century. The mine is owned and operated by Armstrong World Industries Canada Limited. Note the production benches in the quarry face, development of a new production bench on the quarry floor, and the drill and other mining equipment in operation. The present-day operation is vastly different from the early operations. Most of the early works were aimed at mining pure pyrophyllite instead of the pyrophyllite-bearing rock. The blasted mineral is sorted visually, and the ore is separated from the waste and taken to the crusher. Samples of the crushed rock are taken and analyzed. The crushed ore is blended to meet the manufacturer's specifications and is shipped by boat to the U.S.A., where it is used to make high-quality ceramic tiles. The soft pyrophyllite is a good carving stone. One can find pyrophyllite carvings and engraved polished slabs of pyrophyllite at local craft shops and shows. 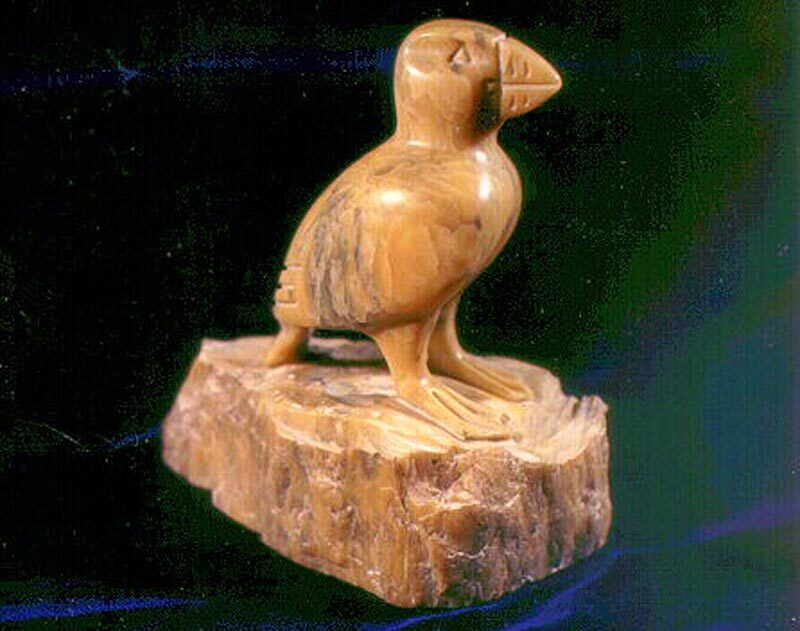 This sculpture was carved from pyrophyllite by Nath Noel, The Stone Garden Gallery, St. John's, NL. It is the property of Frank Blackwood. Why does pyrophyllite occur in the Manuels area? 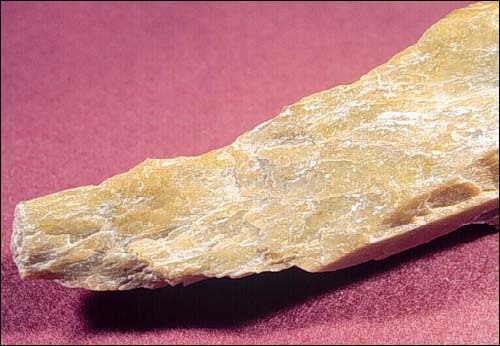 Pyrophyllite forms when hot fluids from deep in the earth come into contact with volcanic rock, which is chemically transformed into pyrophyllite. The hot fluids can also carry other metals such as gold and copper (the gold deposit at Hope Brook in southwestern Newfoundland formed this way). Because the Manuels deposits occur in volcanic rocks similar to rocks in other areas that host gold deposits, geologists and prospectors have been searching for gold in the Manuels area. Sampling done by private prospectors and the Department of Natural Resources indicates some gold anomalies. The mineral claims map for the area shows a number of claims staked for gold surrounding the original mining lease of Frederick Andrews. The mining history of the Avalon Peninsula may be far from over.